Why Is My Mail to this Person Not Getting Through? - Ask Leo! Why Is My Mail to this Person Not Getting Through? Spam prevention measures have made getting email delivered more difficult. We'll look at ways to maximize the chances your email will make it through. Even after all these years, email spam remains a serious problem. With some people (like me) getting literally hundreds of unwanted messages per day, most internet service providers (as well as some individuals) take drastic steps to reduce the amount of junk mail arriving in their inboxes. A problem with any anti-spam measure is that it will block some amount of legitimate email as well. If email sent to one person is not getting through, but email sent to other people is generally working, it could be your email is being blocked by an anti-spam tool. It’s easy for email to accidentally “look like” spam. What recipients think is spam is not in your control. Reputation of the sender, and any services used, matter more than ever. Spam generally doesn’t cause bounces, but is discarded or placed in a spam folder instead. The receiving system thinks your email looks too much like spam. The receiving system thinks you have a reputation for sending spam. Note that I said thinks. It’s the mistakes associated with that thinking that cause legitimate email to be mistaken for spam. Sexually explicit terms or phrases. Certain drugs (typically linked to sexual performance or characteristics). SHOUTING. Spam filters often consider shouting (typing in all caps) as sales copy. HTML email. It’s not a huge mark against you, but some spam filters still consider HTML or “rich text” email as having a higher likelihood of being spam when compared to plain text email. It’s important to realize that no one is saying that any of those things in your email is bad, or that any one of those things will cause your email to be blocked. The unfortunate reality of the situation is that the more your email looks like spam, however innocuous, the more likely it is to be treated as spam. Despite this list of factors that might contribute to your email being considered spam, things aren’t nearly so cut and dried. When someone hits the “This is SPAM” button in an online email interface (like Gmail, Outlook.com, and others), that system takes that to mean “Email that looks like this is spam to me.” If enough people mark similar email as spam, any email considered similar to that email stands a much higher chance of being automatically filtered as spam, regardless of what it contains. For example, if a million people on an email service get an email that says “The sky is blue”, and half of them mark it as spam2, that particular email service may consider “The sky is blue” as an indicator of possible spam. Future emails that contain that phrase might be more likely to be filtered out as spam, and not arrive at their destined inboxes. What that means is that anything could be labeled as spam, depending on what everyone considers spam to be at any point in time. There’s almost nothing you can do about this. Another factor in determining the authenticity of an email is the reputation of the email’s source. 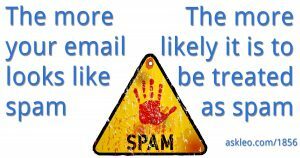 In the past, email was blocked because it came from an IP address identified as related to spammers. Because spammers now use botnets to make it look like spam comes from millions of different IP addresses, this technique is less effective than it used to be. Unfortunately, it’s still in use. Certain email providers have bad reputations. Hotmail used to be a hot source of spam, and simply sending from a Hotmail email address was considered a strike against you. While Hotmail (now Outlook.com) has improved, some ISPs and services simply have better reputations — and better deliverability — than others. This is particularly true of mailing list providers: some have better reputations than others, and thus are able to more reliably deliver email. This is one reason I continue to use Aweber as the email service provider for The Ask Leo! Newsletter. In any case, the only “cure” for a provider with a bad reputation is to switch to one with a good one. Because bouncing email flagged as spam would give the real spammers too much information about how to bypass the spam filters, it’s simply not done. Email flagged as spam is simply not delivered, or is delivered to the recipient’s spam folder, where they may or may not find it. A quick test to make sure that any email can get through is to use another provider — for example, a friend’s email account on a different service, or a free account on another service. Why Isn’t Outlook’s Junk Mail Filter Stopping More Spam? - Outlook is doing the best that it can with spam, but your expectations that it can block spam based on the From addresses is a tad off the mark. Why Is My Email Marked as Spam? - You can end up with email marked as spam for many different reasons, usually involving reputation - and not only yours. How Can I Tell If My Email has been Blocked? - Email usually works, but it can fail to arrive for a number of reasons. Being blocked is only one, and it's nearly impossible to tell which has happened. How Do I Unsubscribe from All These Unwanted Emails? - There are emails from which you should certainly unsubscribe when you no longer want them. However, there are emails that you absolutely should never unsubscribe from. I'll review the differences. 1: I’m not including examples, because this article does go out via email, and I don’t want it to get marked as spam. 2: To be clear, I have no idea what percentage is needed to make something happen; I’m just using these numbers to illustrate the technique. TAGS: spam, The Best of Ask Leo! « Previous post: What’s a Screen Shot and How Do I Make One? How will I know if I am on someone’s block sender list? That’s what can be so very frustrating. Most of the time you can’t. Dear Sirs. :Please be advised that when corresponding with my sister, who has Earthlink as a service provider, she can retrieve my E-Mail messages, but is unable to send them to me, as they are returned, despite the fact that I have not blocked them off my address book as “spam”.I do not know what is the best alternative, for all mail has been “unblocked”,yet she cannot get through. Her E-Mail is: hsteyer@iopener.net Thanks for your assistance in this matter, and hope to get a favorable response.Tommy Steyer. When the messages are returned to her there should be some kind of diagnistic information included. If you can get that it would help diagnose the problem. Why is it that I can receive email but when I try to email anyone they don’t get my email. I got a message that I was being blocked. Now they say my password is in correct if I try to go in get info to see how to get unblocked. Please help. I have Verizon do I go to them to help me. If you have a Verizon email address, you should be able to phone them for support on this problem. I believe you do. That message you were blocked might also have had additional information that would be valuable to whomever you ask for help. When I log into my yahoo account, and i go into my mail it says “welcome Joshus” and it says i have 1 or how ever many e mail that i havent read, but as soon as i go into mail the whole site goes into a search site. See i cant get into my mail because of this im in serious need of help. How come I cant access my mail and why does the site go to the search site? help please. i have been chatting with this lad we had both been sending each other im messages . then i sent my pic. and every time i send him an im it says hes off line. but i no he is on most vdays. im thinking he might have blocked me or changed his screen name could this be so? my x is stalking me via email and im – i block her but she just makes a new screen name ..AOL9 ..aol say they cant do anything other than me block all unknown senders which is not an option as my business mail comes to that account ?? Please help . If the screen name keeps changing I’m not aware of any technical solutions, other than what AOL has suggested. MY SISTER CHANGED HER ADDRESS FROM AOL TO RR.COM AND SINCE THAN HAS NOT BEEN ABLE TO E-MAIL ME. WHY NOT??????? You are not alone. I cannot getthru to my own husband due to his rr account! We tried all we know. What happens when she tries? when i try to go to my own e-mail it says that it wasn’t found. what’s that all about? When I try to go to my own email address it says that it wasn’t found. What’s that all about? Why do my emails with a ‘Hotmail’address always get returned? My emails are returned stating….. the following address had ‘transient delivery errors’. If my friend blocked me, how can I unblock it? Can i find a friends new email address by using her old address? How can I get this persons email address? Nope. It’s very difficult to find someone’s email address. Typically they must tell you. Hi could you please help me i have tried to respond to a very important e-mail how can i get my resoponce to the person. You haven’t provided the entire error message, so it’s hard to say. My emails with a ‘aol’ address always get returned? We had recently been black listed due to spam being sent from our domain without our knowledge, this has since been rectified and we have been removed from these black list, I wonder if we are on aol’s black list, how do we get off the list? A few years ago Kim Komando said that her emails to AOL addresses were not getting through because people were clicking SPAM instead of unsubscribe. She had to contact AOL numerous times not to have her newsletter unblocked. I *wish* I had an answer for you. I also help moderate a mailing list that has been having massive delivery problems to AOL addresses. It’s unclear what we’re supposed to do to get our mail delivered. When I reply to my mother’s email, she doesn’t receive my message. We both have Verizon accounts. My father receives his and they’re in the same house, just different email addresses. Any idea what’s happening? Is there any way to verify if a hotmail e-mail is getting through or being blocked on another hotmail account? if there is so much spam trouble, why dont isp’s start sending authentication ie your email program must log on the send an email. i can recieve mail from russia but not send. all other mail is getting through. please help me i am in love with a russian model!!!! Some ISPs doing a lookup on the IP address of the SMTP server sending the mail, are not just checking for blacklisted addresses, but looking at the resolved DNS name. If it looks like something that might by dynamically assigned (e.g. user-0cet4xp.cable.mindspring.com)it will reject it as a potential bot. This causes small businesses with a DSL or cable IP connection that have their own SMTP server headaches. They either have to get their ISP to change how the IP address is resolved (for static addresses only) or relay mail through the ISP’s SMTP relay. I have been having trouble recieving email from my sister-in-law in New Mexico. She has an MSN email address, I am recieving email from Florida and Missouri. Should I contact my server or what? 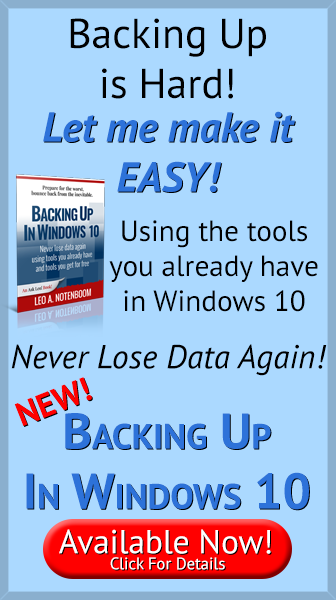 I have contacted Microsoft about the problem, since they are the providers. It is getting very frustrating. I am hoping you can help me. She thinks I have blocked her from my computer, and she mentioned something about a filter in the letter she sent me about this problem. Please can you help me? spam filter triggered on some of the words in that email. however else your ISP supports configuring your spam filters. I have an email I rec’d from brother and wish to send to friends–internet explorer email refuses to send content of message, including to myself. people complain where is the message? how do I remedy this. I am unable to receive e-mails from [email address removed] or [email address removed]. They din’t bounce or show up as junk mail. Both accounts are usually used on the same computer. Any suggestions? I have been emailing my husband’s work email and numerous colleugues at his work and all of a sudden – my emails are being returned undelivered saying Barracuda spam firewall has refused?? can you clarify. Sounds like something about your email looks like spam. There’s no way for me to know what, you’ll need to check with the people at the other end. My e-mails that I send are saying that they are sent, but they never get received. I am trying for days now to send an email or reply to any of my friends I have received the emails from. There is no chance for my emails to get through! Once I click send, this is the notification that popps up in my screen: “Are you sure you want to nevigate away from this page? You haven’t sent this message. Are you sure you want to discard it? Press OK to continue or Cancel to stay on the current page.” Regardless of what I press (either Ok or Cancel) it will take me to the HTTP 403 (The webside declined to show this webpage) and my message never gets through! I began hearing from people that they had not heard from me for a long time. I had been sending out jokes with up to 200 names in BCC. I remembered AOL kickbacks mentioning the reason being headers with more than 32kb in size. My 200 names were in groups of various size. I measured a test email with 85 names in my largest group and found [in properties, and before I put any text in] that the 85 names were 25.5 kb in size. I did my emails in three bunches with the 85 by itself, and the rest in two other emails. They all go trough now with out a probllem. Size was my problem. I’d been sending mails via my phone for months before I discovered that there were not really through and those ones sent to me by friends via phone I couldn’t get either and I’m still facing the problem now! You people should do something fast about it. she never receives my emails. I see a few comments about Hotmail rejecting their emails. I went through that a couple of times. Hotmail has overly aggressive spam filters and sometimes blacklists entire email companies if one their clients sends spam to Hotmail clients. My suggestion switch from Hotmail to GMail, which incidentally had quite good spam filtering. work for a doctor and sometime works at home. Sometimes I get thru. Is their server down or what is going on? Why shouldn’t I post my email address in a public forum? Comcast (one example) will block email as spam based on the criteria Leo laid out. However, they don’t send anything back to the sender so the sender has no way of knowing whether the email is delivered. Email volume seems to be one of their triggers. Very frustrating when you are working on a project with someone. To get an answer you will need to be a lot more specific. Include things like what kind of a computer you are using, what browser. Do the emails get to some people and not others? How do you know they are not getting through, and what error messages you get. Another criteria which I use (and this may be considered rude or drastic to some others) is that if the email contains no description in the “Subject” line, AND I don’t recognize the sender, it goes in the trash. I have rarely lost anything important by doing this. just this morning I worked with someone who wasn’t getting email from a friend. It turned out that the friend’s email address had been put in the outlook blocked sender’s list. There were other email addresses in his list that he was surprised at, so we cleaned it up. This didn’t fix the problem of how they got in the list, but at least he gets email from my friend now. Leo, Thanks for this article. My email was not getting through to one person. I ran a test deleting the hyperlinks in the signature and it got through. I recently have not been getting emails from one customer I do business with. It will go to ac recipient that is copied on the email, but I won’t receive it. Could this customer if mine done anything to change their emails (spam) or anything else? What do I need to do so I can receive their emails in the future? Thank you in advance for your time and looking forward to your answer. It’s almost impossible to say. You might try setting up an email account with a different provider and seeing if they can email you there. Leo, very often I try to email a company using their “contact us” information link and the email doesn’t go through. I click the send button and nothing happens. It’s kind of frustrating. Is there a way around this issue? That would be a problem with that particular company’s website. It could be that their form simply is coded wrong and does not work. Very often they are using an old technology that does not work well with online email clients such as Yahoo. If you see a blue link for an email address then they are probably using that old technology which expects to open a default email client on your computer (such as old Outlook Express). If you are using an online service then there is nothing to open and the link fails. The solution is to simply copy the email address provided on the page, go to your Yahoo mail (or Gmail, or Outlook.com, etc.) and start an email. Paste in their address in the “to” field and you are ready to go. A workaround would be to open a new email address to send email to this company. Can’t receive any e- mails on my yahoo.com account , wondering if I have something turned off on my IPad in the settings that should be on??? I was receiving up till Oct. 10th now no emails………I am waiting on some to come in and it is aggravating. Some are receipts for a condo…..
Maybe you changed your password in your Yahoo account. Try checking your account from your computer and see if you can get in. I am unable to send emails to my friends using my Google account. Not nearly enough information to go on. What happens when you try? Amazing that this 15 year old blog still holds true today! My emails started not getting through this past summer; the problem was intermittent; I never knew when it would not go through and it was frustrating! I changed email service providers and the problem still continues. The only one that sends me a delivery failure is Google, saying “Our system has detected an unusual rate of 421-4.7.0 unsolicited mail originating from your IP address. To protect our 421-4.7.0 users from spam, mail sent from your IP address has been temporarily 421-4.7.0 rate limited.” Others where I don’t get the mail delivery failure notice just don’t get delivered. I’ve been using alternate email addresses or the telephone to get my correspondence completed. I was told the problem is that some other user on the email hosting site is using their server to send huge amounts of spam. Google sees the spam coming from that server address and is blocking all email from that server even though my email is not spam. The only way around this would be to get an email provider that does not allow that kind of activity from their other users. I’ve also been told by the email host that the issue is with using proxy servers (which most hosting companies do) which switches the IP address every 10 minutes so if one of those servers gets blacklisted, every time you send an email through that server, Google will bounce it back, until the proxy server gets cleaned up. That’s why the problem has been intermittent. So G Suite and Office 365 were mentioned as alternatives for my small business. Is there any other solution to get email through than those two that would be cost effective for a very small professional office of three people? AT&T emails with sbcglobal.net addresses were not working for about 3 days, but they have started sending and receiving again today, with one exception. Neither SBCglobal.net nor outlook addresses will send to each other. I’m facing a strange issue, where an email from one particular email id is not getting triggered but using the other id it’s getting triggered. In case , its marked as Spam, is there a way to remove it from the spam category. Regards, Jayant. e , why would a computer see that as spam, I don”t get it ! There’s no point in asking why. Spam algorithms are always changing based on what people click as “this is spam”. Not your Minister, but others. The systems start to learn that “mail like this, right now, looks like spam to a lot of people”. And yes, sometimes they get it wrong. And to top it off, it could all change next week. I have been emailing an attorney for over a year, and the last snail I sent she didn’t reply for some time. She “claims” my email went to her “junk” folder. I don’t believe her. Why after a year would my emails stop reaching her inbox? Just sent another one a month ago. No reply. I think she’s ignoring my emails. What can you tell me? I would think as an attorney they’d have a way to mark all of their clients as “contacts” so that their emails are always recognized. I mean…. I’m sure her top priority clients emails aren’t ending up in her junk mail! I can’t tell you much. Spam algorithms are always in flux so it’s very possible that your email COULD start landing in a spam folder. It’s also possible that they’re ignoring you. No way to know. It may also be your File > Mail > Compose Messages settings. If you have it on Rich Text that can prevent some users from receiving your attachments. Instead of an attachment they will get an icon that does not do anything. Change “Compose messages in this format” to HTML or Plain text. Google asked me to change my password, I did. Now when I try to send an email it asks for my password and will not accept either the new or old password. Now I cannot send an email. No matter what i have done, I still have no email. I have been emailing my sister at a couple different addresses for years. During the last six months or so she has been unable to receive mail from me whether I respond of of her sent email or I create and send new. I am able to send and respond to other people. Does this seem to mean that she has blocked my emails with a spam filter. Could there be any other reason? It’s possible that her ISP considers your email spam, I suppose. Try using a different email address / service to send from. Delivery attempt from MAG: smtp687.redcondor.net to receiving MTA failed. My Mom was BCC’d on a personal message, a reply to a friend about legislation in my Mom’s home state. I did not want to expose her address on my friend’s machine. A few days ago, my personal email to family members about an online meeting was similarly blocked to all gmail addresses. My research indicates that gmail will not help me unless I have a gmail address myself, and I don’t want to give Google my PII. My newsletter mass mailing for business clients is scheduled soon and I fear the worst. (I recently coped with the SPF_FAIL problem via a DNS configuration change.) I would appreciate suggestions for coping with this new gmail-specific problem. One approach would be to forward the sent mail, rather than BCC’ing her. One sign of spam is when the recipient is BCC’ed.